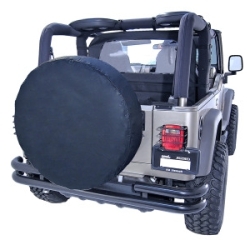 Soft 4x4 Wheel covers - Buy your wheelcovers online! 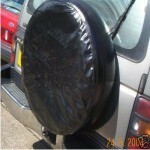 Looking for a high quality spare tyre cover? Our lowest priced wheel cover offers stylish looks with value for money. The black leather look PVC is totally weatherproof and washable. They are resistant to all types of weather including extreme hot and cold, oil, petrol and salt waters. They can also add value to your vehicle as an inexpensive solution to a missing wheel cover for the spare tyre on the rear your 4x4 car. Available for all makes and model of vehicle including trailers, caravans and motorhomes. 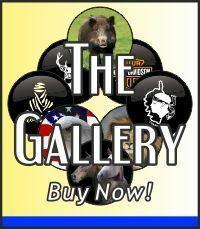 We can now customise your wheel cover with simple images and text. Please get in touch for more information. This very affordable wheelcover offers durability, easy maintenance and installation thanks to its elastic tightening behind the tyre. 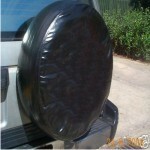 Our wheel covers are not made as small, medium and large. There are many different sizes which perfectly adapt to each tyre size / make and model of the tyre. Therefore, please choose your exact tyre size to order from the drop down menu – then click ‘Buy’. If you cannot find your size, please contact us using the contact us button and we will use the measurements of your tyre to find the perfect match (and add it to our list). 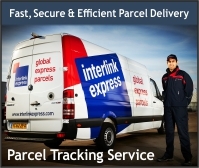 Other destinations outside UK mainland – please see our delivery page.